The "Mighty"Southern Region traces its origins to 1929 when Roberta F. Bell was elected as the National First Anti-Basileus. She served through 1934. At that time, the National First Anti-Basileus also performed the duties of national organizer. At the same Boule in 1929, Roberta was appointed to serve as the Southern Regional Director and given the assignment of organizing a region to be comprised of Louisiana, Texas, Arkansas, Mississippi, and Alabama. From 1929 to 1934 Roberta organized new chapters in every section of the region. From this beginning, the "Mighty" Southern Region began to grow rapidly, and this trend continues today. In 1937, the "Mighty" Southern Region invited the Boule to Houston. The 1937 Boule was the first held south of the Mason-Dixon line, which was the historic dividing line between North and South. Forty-five voting delegates attended. Between 1937 and 1943, the "Mighty" Southern Region grew into the largest region in the sorority. It still bears the name it was given during these years, "The Mighty Southern Region", because it was so strong and gave such excellent leadership to the national body. Many of the projects undertaken by the "Mighty" Southern Region were adopted by the national body, and the national body has grown with many of the ideas initiated in the "Mighty" Southern Region, such as the Blue Revue. The region grew so rapidly and became so large that eventually all states except Texas and Louisiana were reassigned to other regions. This was a logical move because the two states border each other, and there are enough colleges and communities in the two states to warrant a region. Despite their geographic separation, chapters in the region are linked together by a regional director with the assistance of state directors and regional elected and appointed officers. The region is proud to have four Past Grand Basilei who have provided and continue to add wisdom, guidance, and stability to the region. 12th Grand Basileus Lullelia Walker Harrison of Houston, Texas, 16th Grand Basileus Isabel Morgan Herson of Baton Rouge, Louisiana, 21st Grand Basileus Dr. Barbara West Carpenter of Baton Rouge, Louisiana and 24th Grand Basileus Mary Breaux Wright of Houston, Texas. 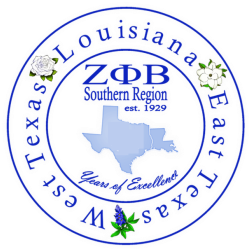 For more information about the "Mighty" Southern Region please visit on Facebook at: Zeta Phi Beta Sorority, Inc. Southern Region .